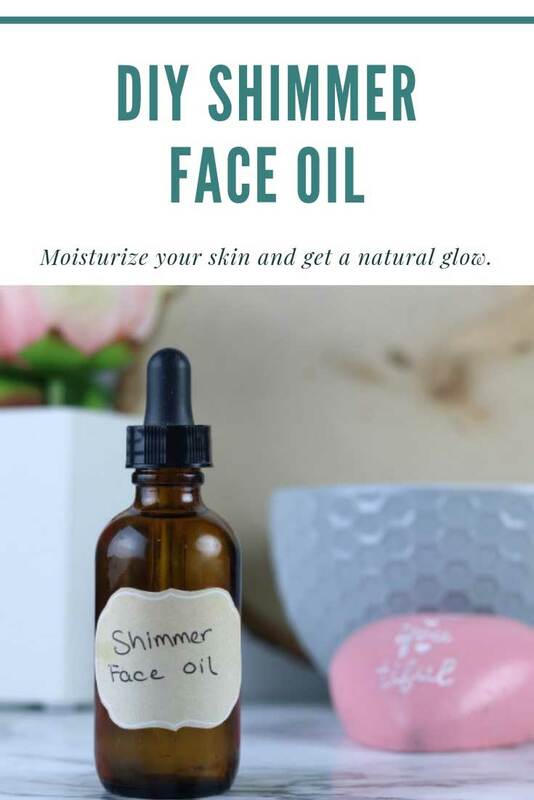 This DIY highlighting shimmer face oil recipe is simple to make. It rehydrates your skin while adding a highlight to your face or body. I love makeup. I love playing with colors and trying new effects. I don't feel like my makeup is complete without eyeliner, highlighter, and at least some gloss on my lips. I use highlighter on my cheeks, nose, and forehead every time I wear makeup. I usually use either Laura Geller Baked or my Hard Candy palettes . While these are amazing highlighters, I also wanted to make my own. 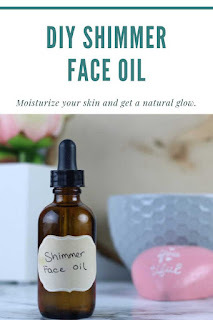 I love the idea of using an oil to make a DIY highlighting shimmer face oil recipe because it also hydrates the skin while adding some shimmer. My skin is normally oily, but it's getting drier as I get older. The winter is usually the worst time of the year for me, but the sun in the summer also dries out my skin. Other than my T-zone, my skin can even sometimes be considered dry. Y'all, this is brand new territory for me. I'm used to washing, toning, and having to use a finishing powder while carrying oil blotting papers with me. When I saw the first patch of dry skin, I freaked out thinking I had some weird reaction to a product. Nope. Just my skin being a butthead in the opposite direction that it usually is. Since this highlighting shimmer face oil recipe is used mainly on the cheeks, it's great for my skin. Even if you do have oily skin, I'll give you some other options for oils to use. I'm calling this a face oil, but you can use it all over. Just use a larger bottle so you don't have to make it as often. This would be great for the upper chest and even your arms to add some shimmer. As with nearly all of my DIY beauty recipes, you have some options. I picked the best carrier oil and essential oil for me and my skin type, but you can use different ones that will be best for your needs. Feel free to get creative with this recipe. You can use an essential oil or not. You can even use two or more oils and mix them if you want. I used one color of mica in my highlighting shimmer face oil recipe, but you can make several of these and use different colors. I like to layer my highlighter sometimes, so you can definitely do that with this shimmer face oil recipe. Or use this all over and add some highlighter to your cheeks for an extra pop. I used apricot oil because it's a dry oil. Apricot oil is also called apricot kernel oil or apricot seed oil, so you might see it with those names. One benefit of apricot oil is that it's a thin oil. It's also a dry, light oil that absorbs quickly into the skin. It's nongreasy, so it won't leave you feeling oily after you use it. It has a one year shelf life, so this highlighting shimmer face oil will last you a year. Two years if you store it in the fridge. Learn more about different carrier oils and their benefits in my book Carrier Oils. 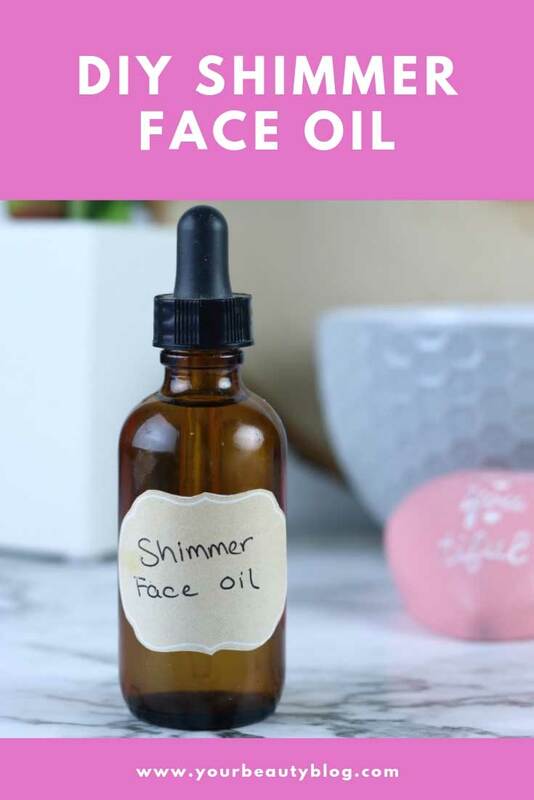 I used frankincense essential oil in my DIY highlighting shimmer face oil recipe. Frankincense is said to help tone and tighten the skin. I used Crafty Bubbles frankincense. I also recommend Simply Earth frankincense. I bought a set of 24 colors of mica to use in my DIY beauty recipes. Each bag contains 0.1 ounce. That doesn't sound like a lot, but this set will last you forever. This set is highly pigmented, and I'm very happy with this set. It's also at a great price. I used the copper shade. There's a red gold that is more gold than red, but it would make a beautiful highlighting shimmer face oil recipe. Add essential oils to the empty bottle. Fill with apricot oil or oil of your choice. Add the mica. Put the cap on and gently shake it. The mica will fall to the bottom, so gently shake before use. Put 1-2 drops on your fingers and use on your cheese, nose, or forehead where you want to add some shimmer. This can also be used on your entire face or on your body. See? 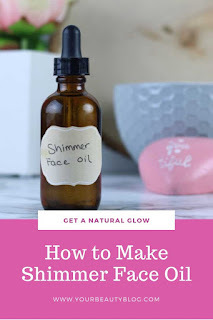 I told you this highlighting shimmer face oil recipe is easy to make! Apply this shimmer face oil recipe where you would any other highlighter. Swipe it on your cheekbones, down your nose, and on your cupid's bow. For more depth, swipe some powdered highlighter over top of this oil on your cheekbones. You can also use this all over your face for a glow. Apply this shimmer body oil recipe to your decollete to highlight this area. Apply in horizontal lines following your bones. Avoid putting it all over or you risk looking sweaty instead of glow-y. If you'll be going out in a sleeveless shirt or dress, apply some highlighting oil to your shoulders for a subtle glow. This makes a great shimmer for your legs, too. It helps the legs look sleek and flawless. Apply this shimmer face oil recipe where you would any other highlighter. Swipe it on your cheekbones, down your nose, and on your cupid's bow. Apply this shimmer body oil recipe to your decollete to highlight this area. Apply in horizontal lines following your bones. Avoid putting it all over or you risk looking sweaty instead of glow-y. This makes a great shimmer for your legs, too. It helps the legs look sleek and flawless. Copyright © Everything Pretty 2019. All rights reserved.